*Due to the limitless possible configurations of the AR-15 rifle system from aftermarket components and the variety of ammunition used, the AR-15 may be under gassed for the VERT buffer system. Some adjustments or modification may be required. *The VERT Buffer system will not work with solid filled 9mm bolt carrier. If you’ve decided that your new build calls for a collapsible stock system or you want to swap out your existing AR-15 stock for a PDW stock, the Battle Arms VERT Stock may be just the component you need to make your build complete. The BAD VERT Stock offers flexibility you won’t easily find in competitors’ PDW Stocks. The design of this stock allows for a continuous cheek rest, even at the full extended length of 8.75 inches. There are four different locking positions so you’re sure to find a comfortable length for most shooters. While other stocks slide freely from the collapsed position, the Battle Arms VERT Stock system locks in place at just 4.75 inches so you don’t have to bother with it while on the move. 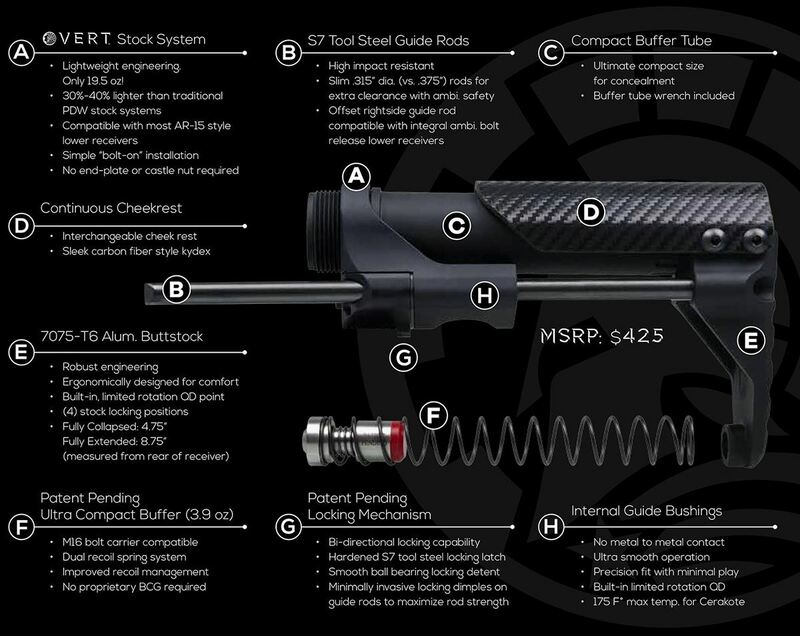 The Battle Arms VERT Stock system brings a lot to the table in a fairly lightweight package. The VERT System weighs in at only 19.5 ounces, including the proprietary ultra-compact buffer and spring system that make it a complete drop-in package for the AR-15 platform. The BAD VERT is precision machined from S7 tool steel and aircraft grade aluminum for durability without a lot of extra weight. It’s finished in Black Mil-Spec III class 2 hard anodized coating for long wear in the field without concerns about peeling or corrosion. Two stationary QD points give you the flexibility to set it up for your preferences and change on the fly. Battle Arms Development, Inc. is an American company based in Henderson, Nevada, that has made it their mission to design, develop, and manufacture advanced tools and components for the small arms market and offer them at a great value.